Whether it was ignorance, a poor choice of words or some combination therein, Manfred’s seeming attempt to place the burden on Trout’s shoulders for not being a bigger star is entirely unfair. It’s almost a mockery: Why does the commissioner of Major League Baseball decide it’s a good idea to try to go after one of the biggest stars in the sport, one of the best players of this generation, and potentially of all time? It’s not Trout’s fault he isn’t bigger than he is. Mike Trout’s job is to take the field and keep being Mike Trout. There’s no shortage of words to describe how he has dazzled and electrified fans for eight years without putting the spotlight on himself — which is especially refreshing in a sports world full of me-first players and attitudes. Trout should be celebrated for being a glowing role model both on and off the field. 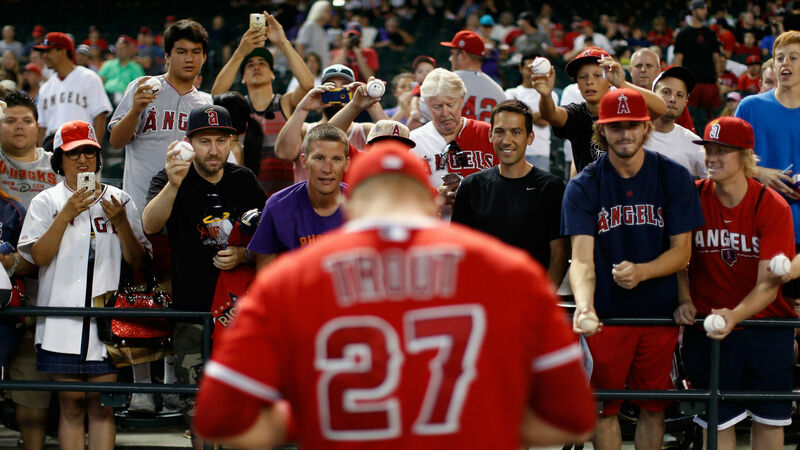 Fans understand what Trout is as a player and a human. Simply put, Trout is a big-time catch for Major League Baseball, and it’s not his job to figure out how to become a bigger name. It’s not on Mike Trout to figure out how to be a bigger star — that’s on MLB. How Trout spends his time away from baseball is up to him. If he doesn’t want to become a mascot or a gimmick for baseball, then he shouldn’t be guilted into being one. He’s already spent assumedly hundreds of hours helping cultivate the game across the country. Once Trout says “no” to the commissioner’s advances to being included in marketing plans, then it’s on MLB to figure something else out. If playing on “one of the greatest players of all time” angle isn’t enough, then I’m not sure what is. Sometimes it’s unfair to boil greatness down into a single number — as one typically does with WAR — but though his first seven seasons, Trout put up 54.1 bWAR. The only other players in MLB history to put up 50-plus bWAR in his first seven seasons: Albert Pujols, Ted Williams, Willie Mays, Mickey Mantle, Barry Bonds, Jackie Robinson and Wade Boggs. That’s it. This is an issue that goes beyond Trout, though. MLB has generally done a poor job of marketing its stars, some of whom are doing historically great things in the game. Marketing these players should go beyond highlight shows on MLB Network and an awkward, 30-second clip during the All-Star Game expressing players’ love of the hit video game “Fortnite.” That clip was essentially this Steve Buscemi GIF. Just look at Bryce Harper, one of baseball’s knights in the crusade to “Make Baseball Fun Again.” What would be awesome is if baseball would take to Harper’s wishes and expand on that. Capitalize on it. What exactly does Harper mean? What does he want? Instead, Harper is pegged as a me-first guy, as opposed to someone bringing passion and energy to a sport that sometimes desperately needs it. Baseball in general is a sport that’s still listening to Aerosmith’s “Dream On” while the rest of the world is listening to Eminem’s “Sing for the Moment.” Both are fine in their own respect, but the insistence on tradition and old-school mentality drives fans away. At times, baseball is the epitome of “Back in my day …”, or “Uphill, both ways, barefoot, in the snow …” or “Those damn millennials!” Some broadcasters take to the airwaves during games to hate on today’s rendition of the game. The same game that put them in that broadcast seat. Try getting fans to get excited about a game while a color commentator sits in a chair, complaining about how “bad” the game is today. Just think about it: This is a sport in which some of its constituents say, “It’s time for us to evolve” while at the same time fining players for wearing colorful sleeves or cleats. Any bit of personality that emerges is met by a vocal minority of fans or players saying to play the game the “right way” — a rallying cry that means absolutely nothing. But it’s baseball’s job to figure out a way to remedy all those issues, even if it means shattering expectations and being — gasp — more progressive. MLB has to go beyond posting clips of nice plays to Twitter, beyond some small mic’d up moments, beyond screaming, “We’re America’s pastime!” to get with the now. That starts with finding a way to make its stars household names and opening fans’ eyes around the country. The Mike Trout situation is a microcosm of a much bigger issue. While the feud will wane, another Pandora’s box has already been opened for a sport that can’t seem to get out of its own way. Mistakes were made when Manfred spouted off. Now it’s time for “The Show” to show up.